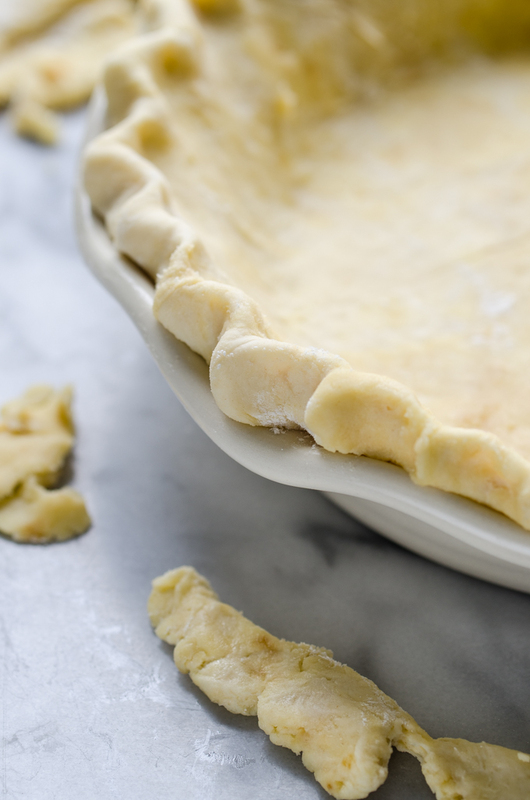 This sourdough pie crust is long fermented for health, and super flaky and a tiny bit tangy. I am continually amazed by the vast array of things you can make with sourdough. And it’s not just a healthy substitute for your go-to recipes. Oh no. Every sourdough recipe I’ve tried has been BETTER than any version of that dish I’ve made before. 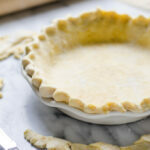 Take this sourdough pie crust for instance. I went into making it fully expecting it be an okay, acceptable pie crust. But it turned out to be the flakiest, most tender pie crust I’ve ever made. I’m no wizard when it comes to pie crusts, and this one was outstanding. Let me show you how to make it for yourself! In the morning of the first day, feed your sourdough starter. That evening, when the sourdough starter is ready to go, mix together your dough. Put it in a bowl and cover it with a plate. Leave it on the counter overnight to ferment. 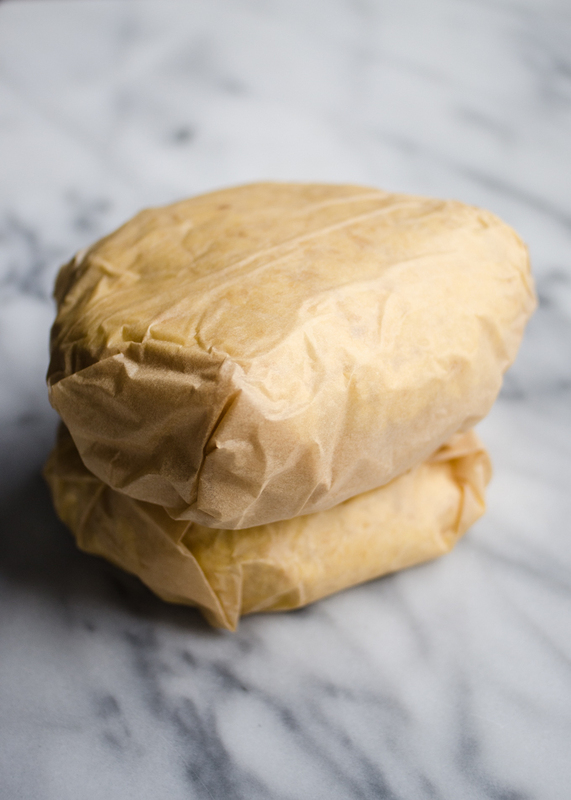 The next morning, divide the dough in half and wrap each half in parchment paper. Put the dough in the refrigerator to chill, at least 1 hour. Now it’s time to roll out the dough! Sprinkle the parchment paper and the top of the dough with flour. Flip the dough and flour the underside (which is now the top) with flour as well. 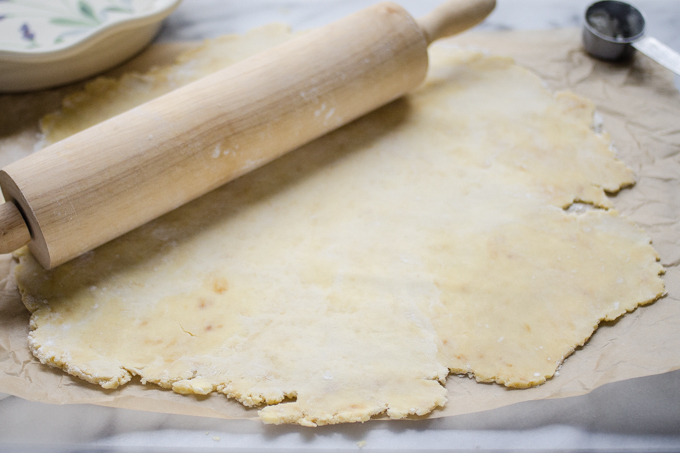 Roll the dough out to a few inches bigger than your pie plate. Transfer the dough to the pie plate. I find it’s easiest to pick up the piece of parchment paper, invert the dough into the pan, and peel the parchment paper off the top. 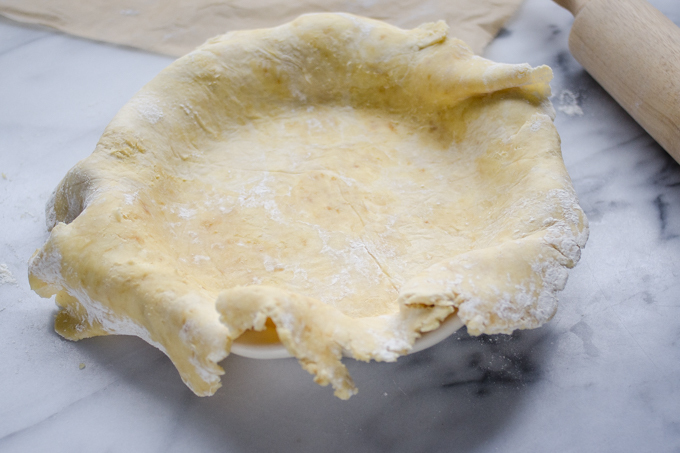 Trim the excess dough off of the edges of the crust. Make sure to save the scraps for later! At this point you can seal/decorate the edges as you like. 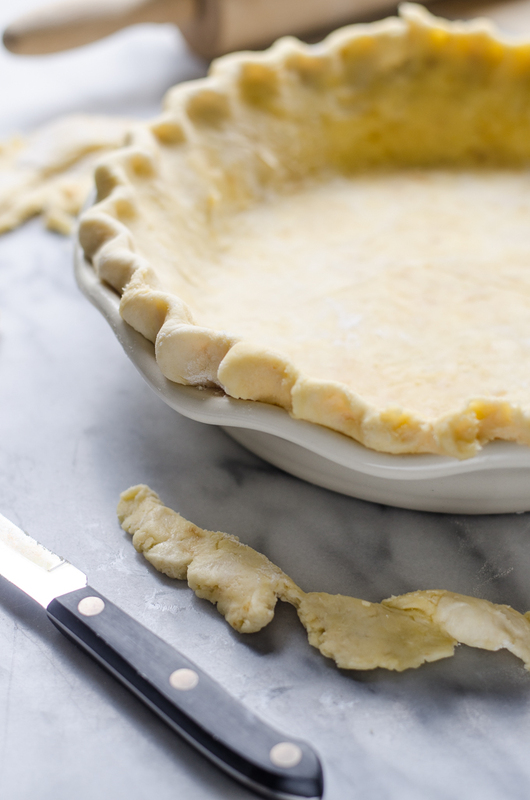 If this is a single crust pie, like pumpkin, you can go ahead and crimp the edges. But if you’re going to put another crust on top, wait until you fill and top the crust to seal the edges. This crust has a slight tang from the sourdough. But if you didn’t know it was sourdough, you wouldn’t be able to detect it. Basically, it adds a lovely flavor that isn’t overpowering. 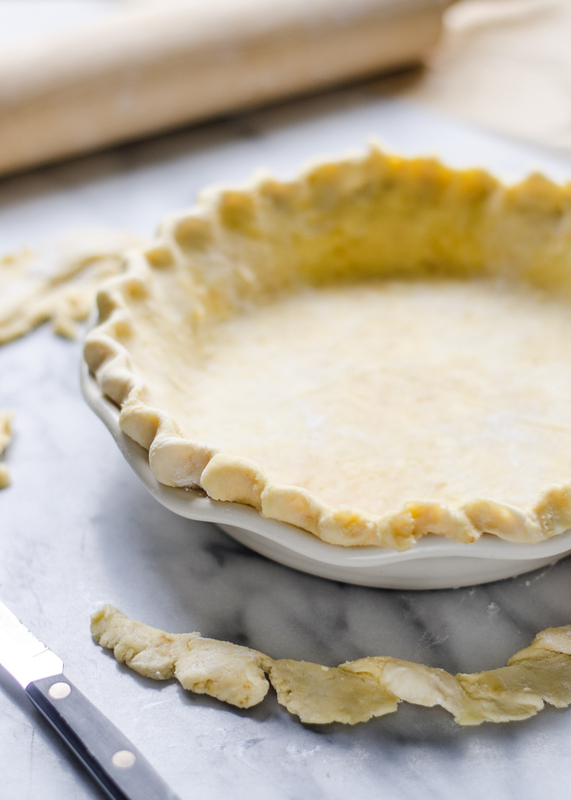 If you have a sourdough starter, I highly recommend giving this pie crust a try. Use it for all your fall/Thanksgiving pie needs. 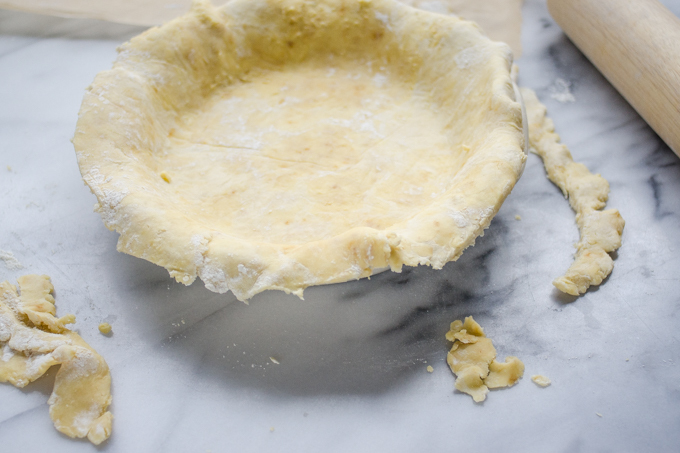 This sourdough pie crust is long fermented and super flaky and a tiny bit tangy. Place the flour, salt, and sucanat in the bowl of food processor. Pulse to combine. Add the butter pieces and pulse until the butter pieces are no larger than pea-size. Dump the mixture into a large bowl. Add 3/4 cup of the sourdough starter and use your hands to mix it into the dough. Mix/knead just until the dough comes together in a cohesive ball. Add more starter as needed to achieve the right consistency. Cover the bowl with a plate and let it sit at room temperature for 7-12 hours. After the fermentation, divide the dough in half. Shape each half into a flattened disc and wrap with parchment paper. Place in the refrigerator until completely chilled, about 1-2 hours. After the dough is chilled, you can use it in your recipe! An "unfed" sourdough starter is one that has been fed 8-12 hours previously and can pass the float test. I suggest feeding your sourdough starter around noon, making your dough at night, and letting it ferment overnight. This recipe was tested with a 100% hydration starter: basically, feed your starter with equal weights of flour and water. Thanks for this very interesting recipe. What is the “Float” test that you mention above? The float test is a test that’s performed to determine if your sourdough starter is ready to be used. You take a small amount of starter and drop it into a glass of room temperature water. If it floats, it passes the test! If it sinks, it usually means that your starter needs to sit out longer to develop more gasses to make it light enough to float.